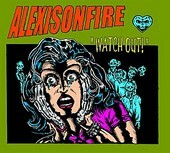 In Music We Trust - Alexisonfire: Watch Out! Alexisonfire is yet another punk rock outfit that utilize the scream-sing technique found so often in today's Warped Tour contingent, yet it's backed by the gang choruses reminiscent of old school punk for a solid shot of validity. This Canadian quintet have got a good handle on dynamics and mood, sounding like the cross between AFI and Atreyu on many of the album's 11 tracks. Alexisonfire have also a strong thread of camp and sarcasm woven into everything they do, which makes songs like "Hey, It's Your Funeral Mama" and "Get Fighted" that much more palatable. While this group decides to follow the herd than lead the pack, they do so with emotionally strong melodies and adventurous compositions like the one found on "Sharks and Danger", helping the outfit stand a little taller amongst the billion other shaggy haired sensitive males.